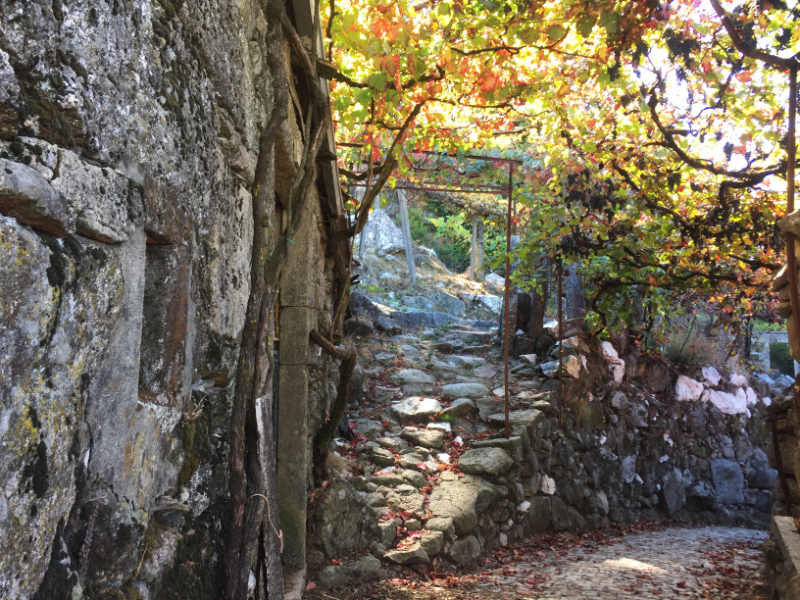 Though most of the road to Brufe is tarmacked nowadays, you will still find stretches made from granite setts, which the Portuguese call 'cubos' – cubes. When I first came to Portugal in the 1960s all the major roads were like this and the suspension in cars was nowhere near as good as it is now. A journey into the interior was a time consuming, bumpy adventure and not always an entirely pleasurable experience. Trips that today take minutes took hours then. Wild horses roam these mountainsides, and we found three on this remote stretch of highway. Though I can't say they looked particularly pleased to see us and sidled skittishly by when we stopped, they did look sleek and well fed because food was plentiful. As you can see from the dappled sunlight on the road, the horrendous fires of 2017 had not penetrated here. The villages along the way also hark back to harsher times with original rough cobbled streets branching off a modern metalled road. These stone built old houses are no longer in use though similar ones were not long ago. 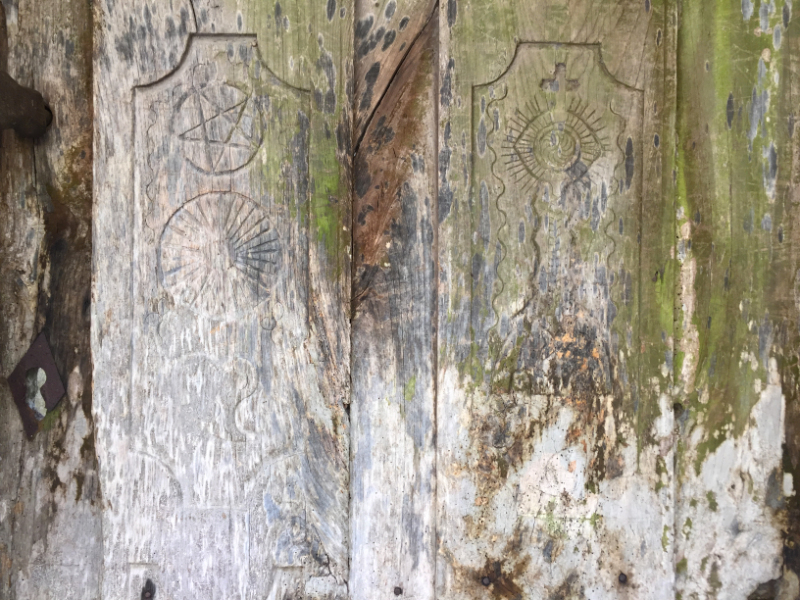 What I haven't seen before are the curious carvings on many rustic wooden doors to abandoned buildings. Some, with apparent religious significance, may be protective icons. Others may have distant pagan roots. On the one below, for example, as well as an overtly Christian carving, there is a pentagram, the fine points of which are often thought to represent the spirit, fire, water, earth and air. Some almost resemble the cartouches painted on the walls of Egyptian tombs. I wonder if anyone reading this knows what they mean. 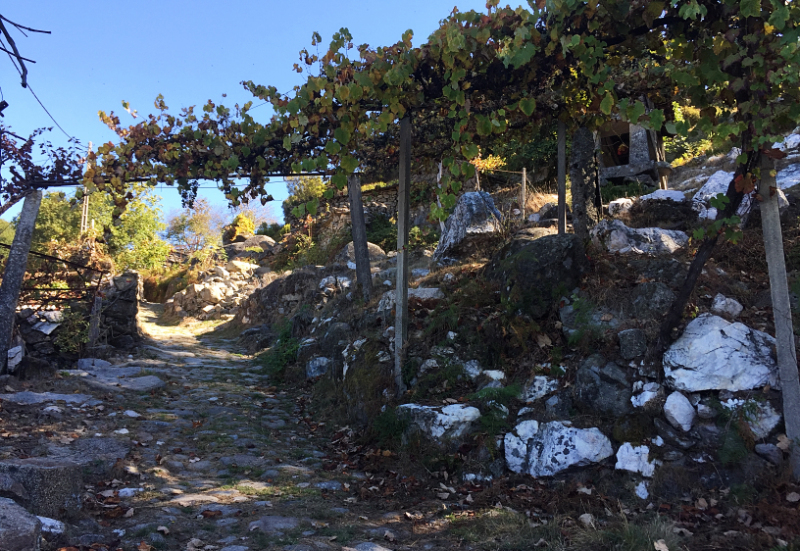 In this village, in late September, the vines which shade the streets in summer still have shrivelled grapes hanging from their branches. In the past, they would have been picked long before now. Unsurprisingly, there is little labour around to carry out agricultural chores for these villages have suffered from mass emigration. Today, many are sparsely populated and most villagers are old. The land around is beautiful but not productive: the work is hard and the climate not always easy; why would the young stay? 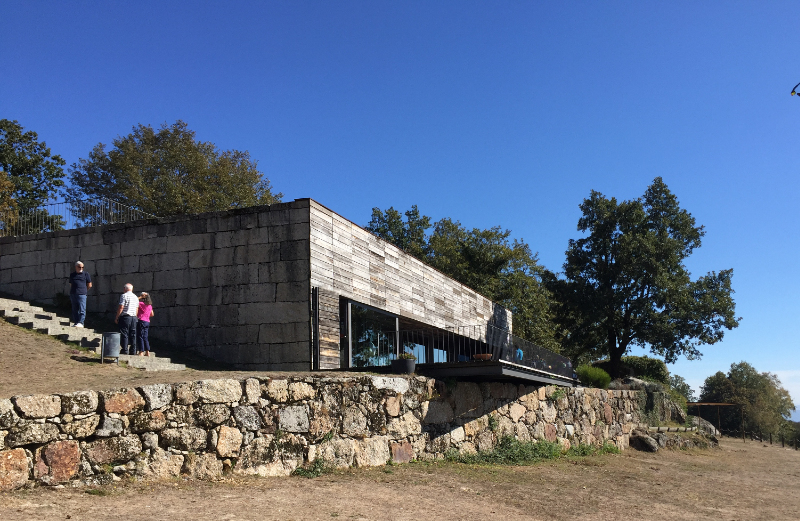 There are large modern houses built by people who have 'made good' either in the cities or overseas but many are closed all year except in August when emigrants return in big cars from France and Germany. 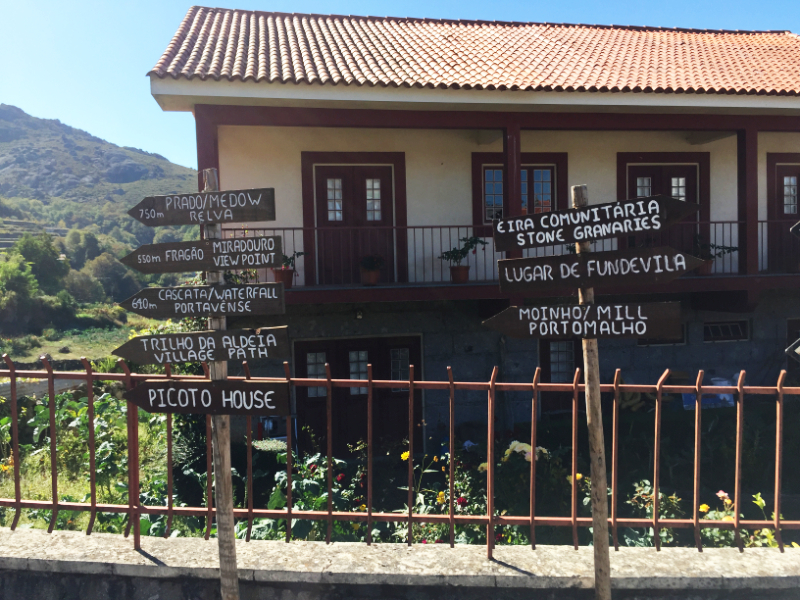 One village is trying to fight back, though, by offering trails to viewpoints, waterfalls, mills, granaries and grasslands. The panoramas around are so spectacular that if enough ramblers could be encouraged to come, tourist related activities relating to accommodation, food and crafts might perhaps persuade some young people to stay. Many trails are uneven, and to avoid twisting an ankle or breaking a leg, you would be well advised to have sturdy boots with good ankle supports, but you shouldn't get too wet or muddy. This trail out of the village leads to mills and viewpoints. So, what can be done to encourage people to stay in these remote areas? One answer has been to make a considerable investment in a stunningly placed restaurant with a curious name: o Abocanhado, which is fairly untranslatable. "Abocanhar" seems to be a local word for 'to improve'. According to the website, "o tempo abocanhou" means the weather has got better – for example, it has stopped raining or snowing. So, I suppose the name means a place where you will feel better once you have eaten and slaked your thirst. The restaurant stands on the edge of the village of Brufe, looking down the valley of the Rio Homem, which somewhat oddly I've seen translate as the Man River. While that is the literal translation, it seems to me that geographical names should remain in their own languages if possible. I don't want to see Ponte de Lima translated as Lima Bridge. Or Manchester translated into Portuguese as Castro de Homem if it comes to that. Here is the restaurant, sleek, modern and totally unexpected. Unlike a couple of hardy souls, we ate inside because the weather was cool but on warmer days you can sit out on the splendid terrace and enjoy the view. Inside there are quirky decorations; a rooster and a hen made from welded keys and a scarecrow with staring eyes that I wouldn't like to come across on a dark night. The menu is slightly bland international though there are sometimes more interesting items such as goat and rabbit. 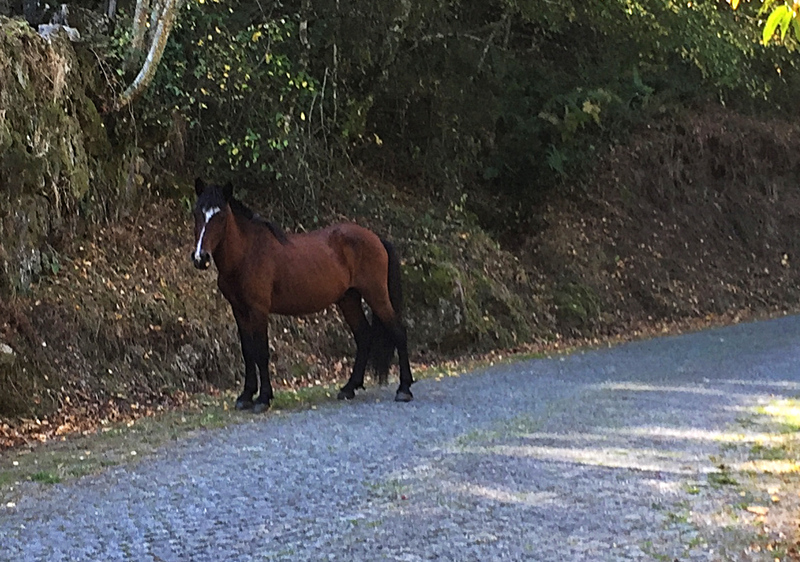 I personally would like to see more traditional Portuguese food offered though arguably that can be found everywhere in the Minho. Perhaps what is needed is 'Portuguese with a twist'. This restaurant is now clearly on the map for visiting Portuguese elites and intrepid tourists. While we were there a big group of bikers, all in the same club uniform called in to dine and there were a number of guests driving far posher cars than ours – amongst them a Ferrari! Now people need to use o Abocanhado as a hub and create other businesses around it. What we need is for them to substitute 'a economia local' for 'o tempo'. In short, we need people to be able to say, "The local economy is on the up" as well as "The weather's getting better". There were signs in the village for rural crafts and artisan products but we didn't manage to find anywhere open. Perhaps they are only function in high summer. 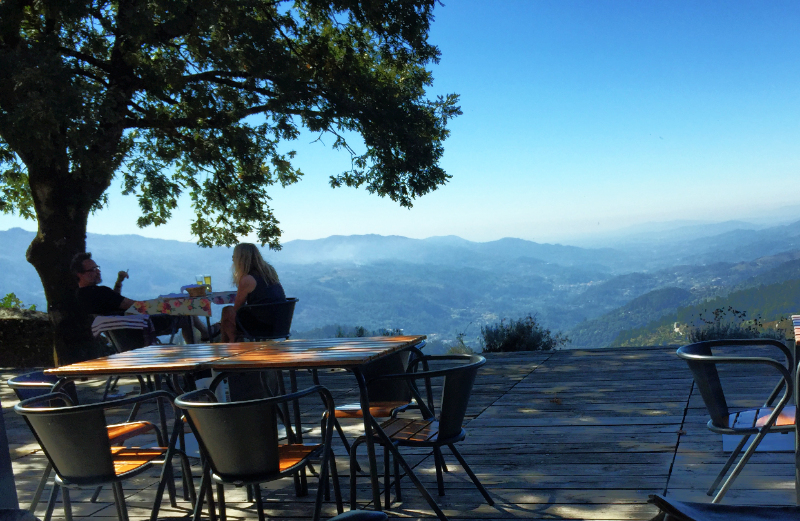 If ever you come to the Upper Minho and would like to visit the far northern corner you might think of calling in on the restaurant in Brufe in its truly magnificent setting.